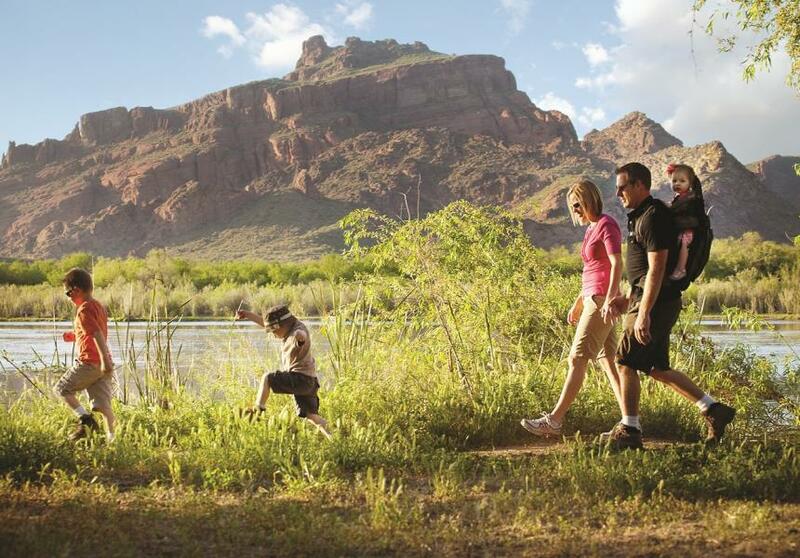 As much as your father may enjoy a “#1 DAD” mug, we know there’s no better way for him to celebrate Father’s Day than by spending time with those that call him “dad.” This weekend, take him out for a meal, a game of golf, some music, a trip through a museum, or more, right here in Mesa, Arizona. Does your dad have a need for speed? Head to Octane Raceway for a delicious brunch, the free-roam virtual gaming arena Velocity VR, and a lap around the race track. Even if he comes in last place, Dad is still the real winner on this special day! Get a gift for you and dad to savor together. Desert Eagle Brewing Company is having Father’s Day special prices on growlers all day on Sunday. $10-64oz growler fills and $5-32oz growler fills (excludes beers on nitro). Or maybe just head out with Pop and share a pitcher? Dads get a pitcher of Domestic beer for just ONE PENNY with any food purchase at Dierks Bentley’s Whiskey Row (Gilbert). Take Dad down to the Mesa Market Place Swap Meet to pick out the perfect gift for himself this year. Treat the whole family to a Market Breakfast (two eggs, toast, and hash browns) for only $1.75 each, and enter to win $25 Mesa Market Place Market Money! Free Admission for Dad on Father&apos;s Day! Dads are awesome! And the I.D.E.A. museum knows that. So, in recognition of all that Dads do, Fathers will receive free admission on Sunday, June 18. 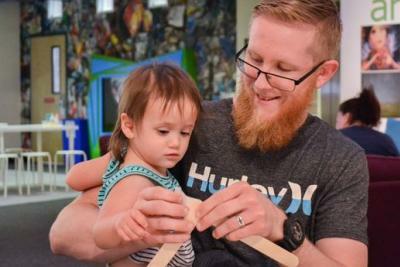 Father&apos;s Day at the Mesa Historical Museum! All Pops, Dads, Fathers, and Dadios get free admission (with a paid admission) on Saturday, June 17th, to the Mesa Historical Museum. The current strange collections of science fiction art include Cat People of the Outer Regions and the art of Karen Kuykendall. Appreciate the tunes from one of the largest theater organs in the world today over a slice of pizza with Dad. Organ Stop Pizza’s Father’s Day Musical Lunch will feature an all-you-can-eat pizza buffet. Purchasing tickets in advance is required. Plan a sightseeing adventure Dad will never forget! DETOURS is offering ice cold Dad&apos;s Root Beer for all guests who tour with them on Sunday, June 18 in celebration of Father&apos;s Day. Tours must be booked at least 24-hours in advance. They say the best way into a man’s heart is through his stomach. Treat Dad to dinner with a view at The Grille at Las Sendas. He can enjoy a mouth-watering 14oz Ribeye, Bacon Roasted Potatoes, Marinated Tomato Salad and Corn on the Cob. Tee up at Longbow Golf Club where Dad can play for free when accompanied by a spouse or adult playing partner who pays the public rate. This course was recognized as one of the “Top 100 Resort Courses in the Country” and ranked as “One of the Top 20 Best Courses You Can Play in Arizona,” by Golfweek. Does your father link to hit the links? 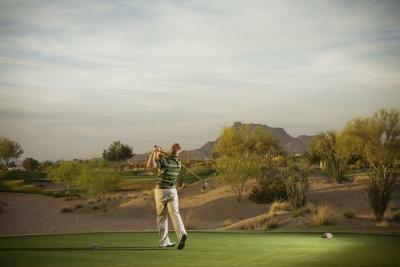 He can play more than 18 holes on Father’s Day with Arizona Golf Resort’s All-You-Can-Play golf special. Dads play for Free! Golf carts and great food and drink specials are included! Can’t spend the day with your Dad this year? Snag some golfing gear for Dad at Augusta Ranch during their Father’s Day Special. Get 30% until June 18 off on all men’s shoes, shirts, and shorts. Have Dad mention "Visit Mesa" to get $5 off admission to a fun-filled escapade at Rockin&apos; R Ranch for Father&apos;s Day (June 16-17)! He and the family will enjoy the Old West experience with an all-you-can-eat BBQ dinner, foot-stompin&apos; musical show, and a riveting gunfight. Head over to The Oak Room Kitchen and Bar for a hot meal this Father’s Day with Dad. Wine and dine him with the Father’s Day Surf & Turf Special: 10oz Ribeye, Grilled Shrimp, Mashed Potatoes, and a choice of vegetables for $27. Grab your flashlight and make your way to the Desert Botanical Garden to celebrate Father’s Day with a free Flashlight Tour with a paid child admission. Hear and feel the desert at night. Explore discovery stations, capture night-blooming plants and purchase s&apos;mores to make the evening complete. We would love to see how you celebrate Father’s Day with your Dad! Show us by tagging your social media posts with #VisitMesa and #MesaCityLimitless!